Minor complications from nasogastric tube insertion occur relatively frequently. Emesis is fairly common when the gag reflex is stimulated by the tube in the back of the oropharynx. 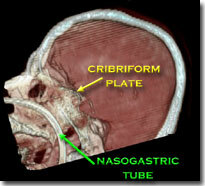 An infrequent but possibly fatal one is insertion through the cribriform plate. The cribriform plate is located directly posterior to the nares and is part of the ethmoid bone. It is very porous in nature and weaker than the surrounding portions of the ethmoid. It is easily fractured, and can be seen is association with basilar skull fractures. This is one source for rhinorrhea in patients with these fractures. Cribriform fracture is a contraindication to unprotected insertion of a nasogastric tube. If you look at the sagittal section below, the plate lies directly behind the nares. When inserting the NG tube, we are usually taught to aim the tube straight back. Unfortunately, this aims it directly at the cribriform. If a fracture is present, it is possible that you may be inserting a nasocerebral tube! The usual symptoms when this occurs consist of immediate neurologic deterioration to coma, and a unilateral or bilateral blown pupil. The tube must not be withdrawn, because it will cause significant injury to the base of the brain. A stat neurosurgical consultation must be obtained, and if the patient is salvageable, the tube must be withdrawn through a craniectomy. first, does the patient really need a gastric tube? if awake, don’t put the tube in their mouth, as they will gag continuously. Instead, place a lubricated, curved nasal airway. Then lube up a slightly smaller Salem sump tube and pass it through the airway. Nausea In The Trauma Bay: Gastric Tube vs Anti-Emetic Drugs? Nausea and vomiting are common problems in trauma patients, particularly those in a trauma activation. Inciting factors include pain, full stomach from food eaten before the event or blood swallowed after, or reaction to pain medications. For years, trauma professionals reached for the lowly gastric tube to evacuate stomach contents to “solve” the problem. But how many of you have seen a patient forcefully empty their stomach as soon as the tube touches the oropharynx? And of course, your patient is lying supine, so the vomitus goes straight up, then back down into their airway. And if their mental status is not quite right, they may aspirate, causing even bigger problems. We’ve had anti-emetic medications for a long time, some more effective than others. Only recently have we begun to rely on these as a first line defense in the trauma resuscitation room. But do they work? Are they safer? The University Medical Center Utrecht in the Netherlands looked at this problem. They changed their policy from inserting a gastric tube to administering anti-emetics at the beginning of 2014. They studied their experience for the 6 months before and 6 months after the policy change. They inserted an orogastric (OG) tube preferentially before the switch, and used ondansetron and/or metoclopramide after. Bottom line: This is a relatively small, retrospective study. Furthermore, the choice of gastric tube route (oral) is a setup for gagging and vomiting. Nasogastric tubes are a bit less noxious, but can’t be inserted in all patients (see tomorrow’s post). Even so, the use of anti-emetics in trauma patients complaining of nausea seems like the kinder, gentler way to go. Which drug to use? Previous studies have shown that ondansetron 4mg is as effective as 8mg, and that this drug is about equally as effective as metoclopramide. There is also some evidence that giving both is more effective than just giving one. 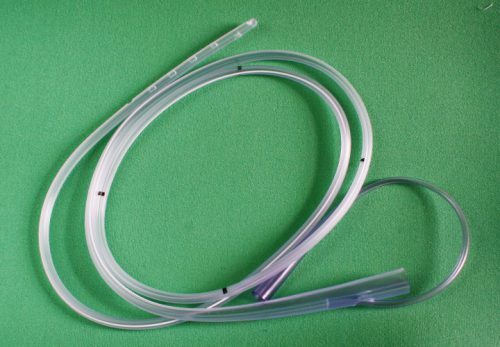 Gastric tubes are still important, particularly in the comatose patient. But since these patients are at risk for cribriform plate injury, only the oral route should be used. Reference: Analysis of two treatment modalities for the prevention of vomiting after trauma: orogastric tube or anti-emetics. Injury (accepted manuscript, in press) online 8 July 2017. Inserting an NG Tube (Not an NC Tube)! On occasion (but not routinely) trauma patients need to have their stomach decompressed. The reflex maneuver is to insert a nasogastric (NG) tube. However, this may be a dangerous procedure in some patients. 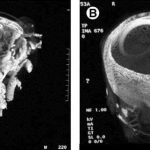 Some patients may be at risk for a cribriform plate fracture, and blindly passing a tube into their nose may result in a nasocerebral (NC) tube (see picture). This is a neurosurgical catastrophe, and the outcome is uniformly dismal. It generally requires craniectomy to remove the tube. If you really need the tube, what can you do? If the patient is comatose, it’s easy: just insert an orogastric (OG) tube. However, that is not an option in awake patients; they will continuously gag on the tube. In that case, lubricate a curved nasal trumpet and gently insert it into the nose. The curve will safely move it past the cribriform plate area. Then lubricate a smaller gastric tube and pass it through the trumpet.